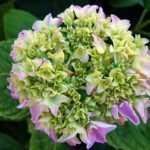 why is my hydrangea losing its flowers? It's a potted blue hydrangea. This can happen for many reasons, but I would guess that it is due to either a lack of water or it has just reached the end of its blooming cycle. Try soaking the pot (with the plant in it) in a container of water. Sometimes when you water, it might not be going into the center of the soil, leaving the plant too dry.